Monday,XII killed Gruul for the first time, and I accidentaly got aggro, and didn't lost it until I died at 10%. I think some of the Healers didn't saw that I had aggro. 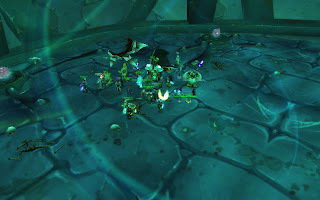 Tuesday we went to Void Reaver, and I hold aggro till around 40%, Too bad we wiped at 8%,but we will get him. Wednesday the guild went to SSC-Lurker, and I put myself out of the raid. They still needed me, and I OT one of the adds. Lurker down again.